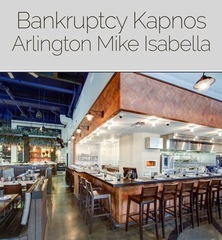 M21992 Bankruptcy auction of this Mike Isabella high-end full-service restaurant, loaded with high-end dining, kitchen and lounge furnishings, equipment & decor. ONLINE NOW! AUCTION CLOSING DATE: Tuesday, April 23rd, beginning at 1:07 pm. Bidding closes on the first item at 1:07 pm, then closes at the rate discussed in these Terms and Conditions of Sale.